Word processing, checking emails or surfing on the Internet - many buyers don't demand much from their consumer range notebook. High clocked dual or quad core processors remain idle for a longer time without being able to exploit their expensively paid for performance reserves. HP believes that this is unnecessary and equips its 15.6 inch Compaq Presario CQ57 with an energy-efficient Fusion APU from AMD's E range. To compensate the rather poor performance, it excels with an extremely low power consumption and low price design. Our configuration, with an E-450, a 500 gigabyte memory capacity and a 4 gigabyte RAM, is available for less than €330 depending on the online shop. Other versions partly still use the somewhat weaker E-300, respectively Intel's Celeron or Pentium processor. The price ranges between €290 and €400 here. The list of potential competitors is a lot shorter in this price range. 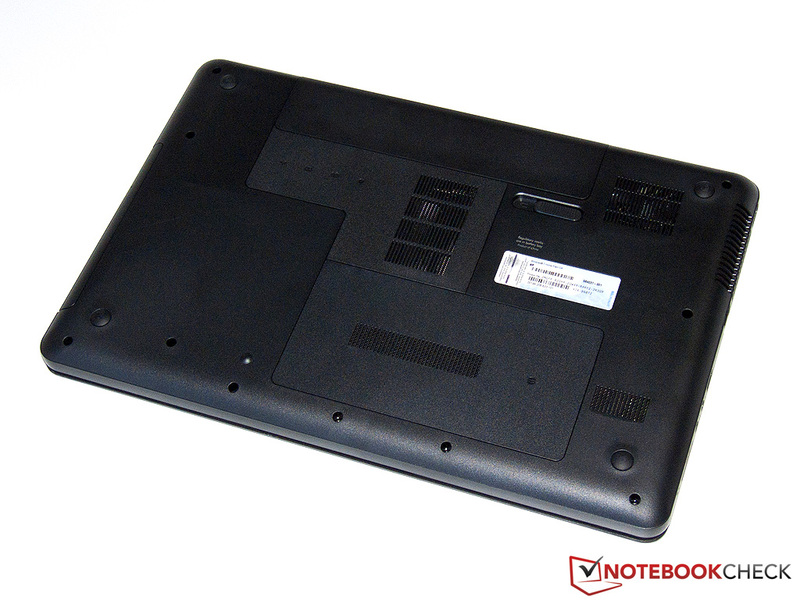 Besides a number of netbooks that can't be used for comparison because of the different target group, only few such cheap models can be found in our database. 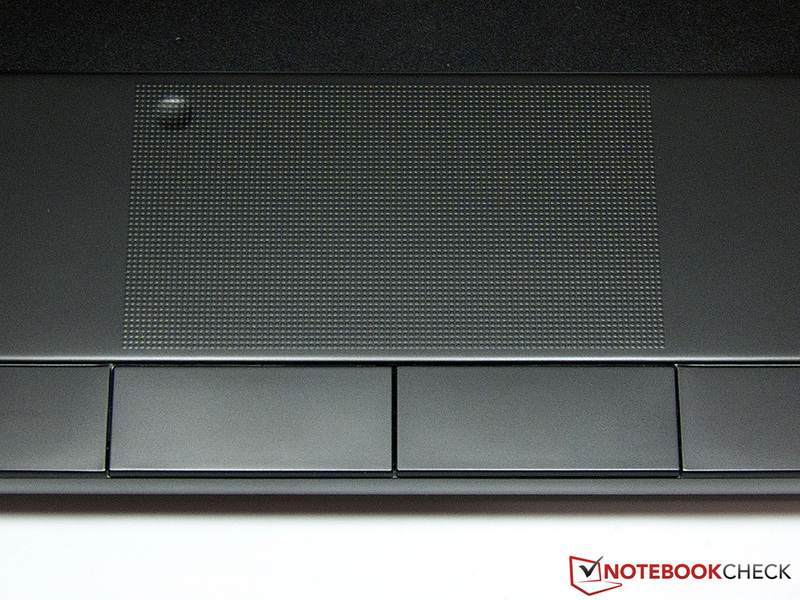 Today, we not only receive this test candidate, but two other notebooks from the manufacturer, as well: The HP 630 and HP 635. 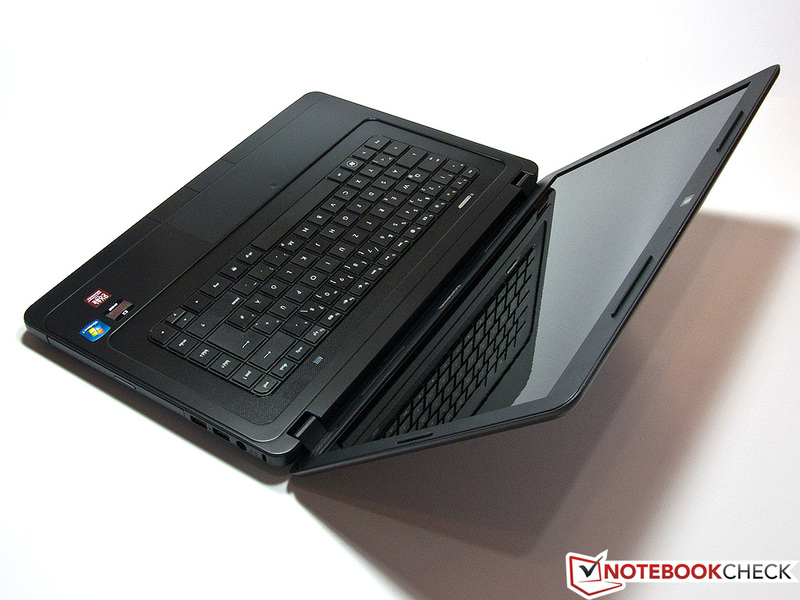 We also send the Lenovo G575 into the fight. Clear the ring for the first round! The workmanship is adequate for the price range. The design of the Compaq Presario CQ57's case is almost an exact copy of the HP 630 and HP 635 models with only few changes. The notebooks can only be told apart by their slightly different colors. Our test sample shows up in a somewhat boring black plastic coat that could have been pepped up a bit by the one or other design feature. Rounded edges and the lack of high-gloss elements make it clear that the manufacturer has primarily focused on functionality in design. The flaws in case stability that were noticed in the review of the HP 635 seem to have been partly eliminated. The chassis resists even higher pressure without warping excessively or emitting a creaking noise. 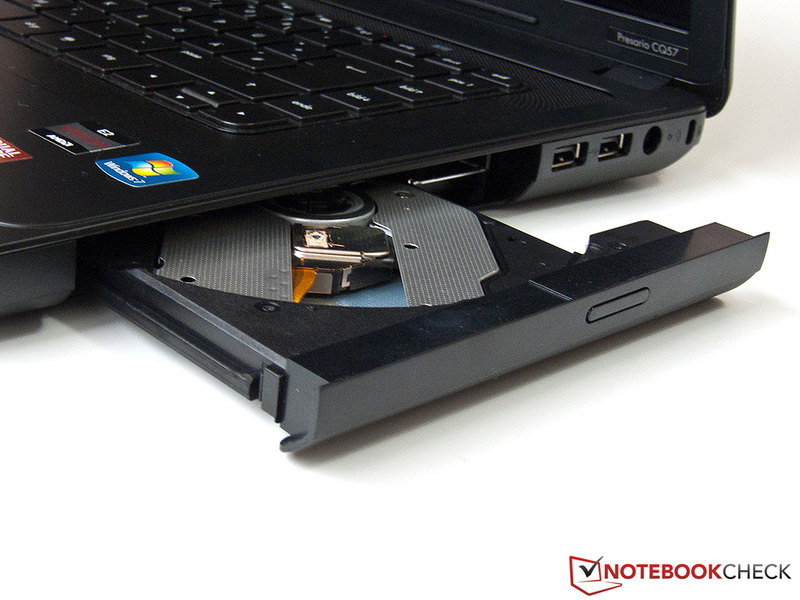 The 2.5 kilogram notebook even makes a good impression in the usual problem areas, like over the DVD drive cover. The display still gives reason for complaint. Its torsional stiffness could be better; both the bezel as well as the back can partly be twisted significantly. Two tightly pulled hinges connect the lid firmly to the base unit and convey a high quality impression. However, they can't completely prevent the lid from teetering in cases of vibrations. It's regrettably not possible to open the device with only one hand. There's not much to complain about in terms of workmanship. A few gaps could be more regular, but most material transitions and case edges are manufactured smoothly and flawlessly. Seeing that the Compaq Presario CQ57 is one of the most affordable 15 inch laptops, the available features are outstanding. Even the slightly more expensive Lenovo G575 is on a comparable level. To make the very low price of just over €300 possible, the manufacturer had to make cutbacks in connectivity. 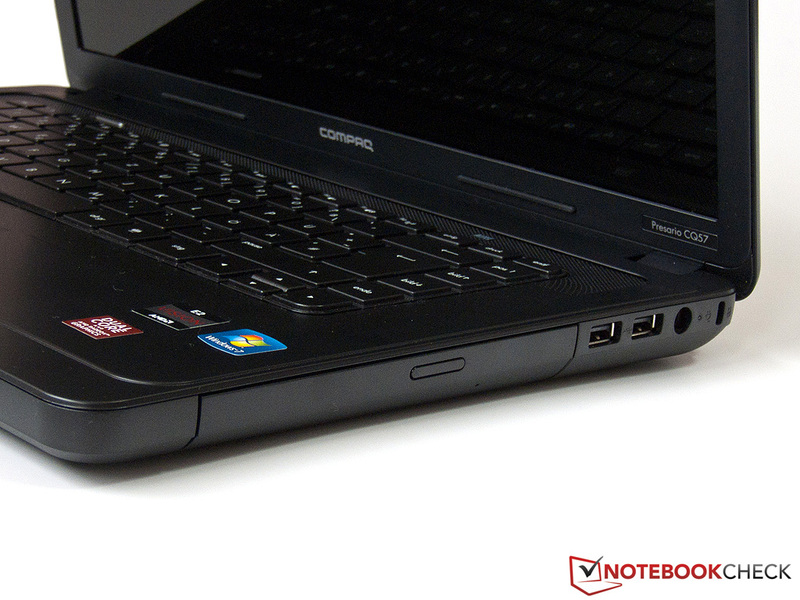 The interfaces on the Compaq Presario CQ57 are distributed on the case's left and right, but many current standards are sought for in vain. HP has installed three somewhat older USB 2.0 ports, which also lag behind the possibilities of this standard. They only have a transmission rate of about 27 MB/s. Instead of a modern HDMI or DisplayPort out, the user has to connect an external monitor via the analog VGA interface. However, it proved to have an unusually good quality in the test: A focused and flicker-free picture was rendered even with a resolution of 1920x1200 pixels. This suggests a particularly high-quality D/A converter. The integrated Gigabit LAN, headphone and microphone jacks as well as the 2in1 memory card reader (SD/MMC) conclude the collection. 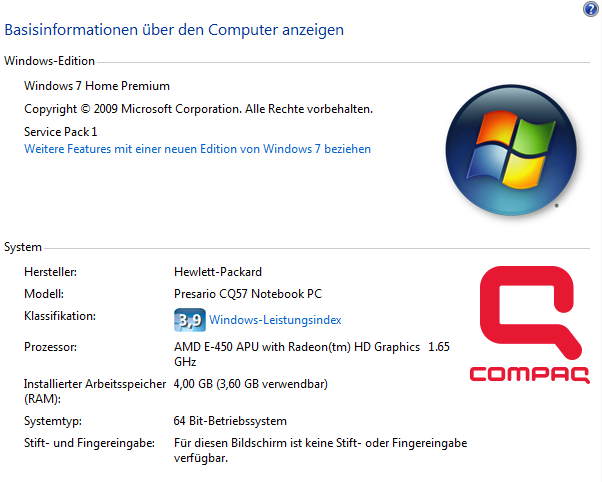 With exception of the omitted HDMI out, the interface layout is the same as in the sister models, HP 630 and HP 635. Apart from two fairly closely placed USB ports on the right, all interfaces are easy to access and sensibly positioned. The stationary ports, such as VGA out and power socket, have been placed at the far rear to obstruct the user as little as possible. The absolutely interface-free rear could have perhaps also been used. The adapter for WLAN connections comes from Ralink and is called RT5390. Unfortunately, the user doesn't have access to wireless networks in the 5 GHz band because the model only supports 802.11 b/g/n standards. A maximum gross data rate of up to 150 MB/s is possible. That other wireless technologies, like Bluetooth or UMTS/HSPA, aren't integrated can be accepted in view of the purchase price. The user doesn't have to live without a built-in 0.3 megapixel webcam and the corresponding microphone. However, the image quality is sooner below average so that we would recommend it only for occasional video chats. In return, the sound quality is impressive. In particular voice recordings sound very natural and very intelligible. The laptop's scope of delivery includes exactly two leaflets. The one is a list of service numbers and the other is a quick start guide. 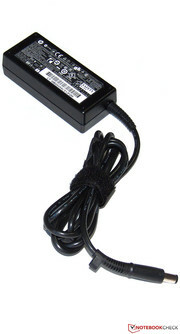 The user finds instructions for inserting the battery or connecting the power adapter here - all other manuals are only included as an electronic issue on the device's hard disk. Where necessary, the user also has to create a recovery DVD. 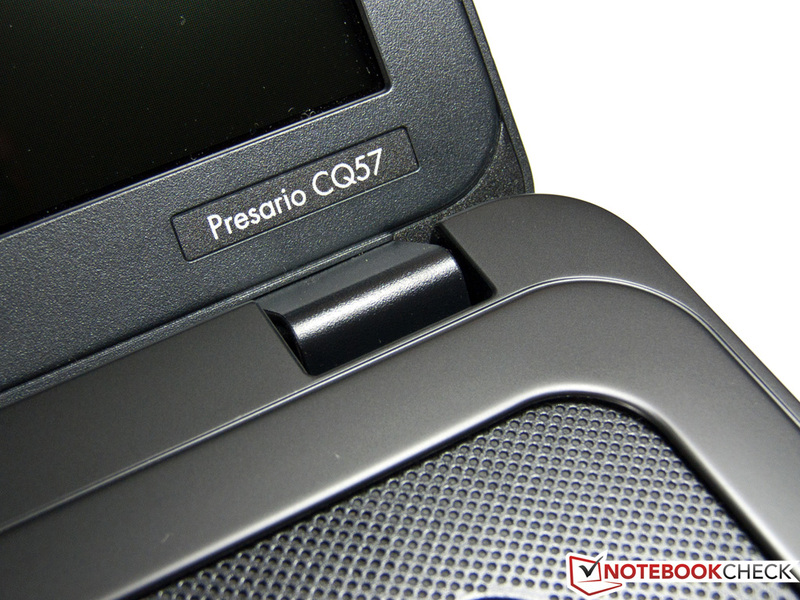 The manufacturer's warranty for the Presario CQ57 is only valid for 12 months. 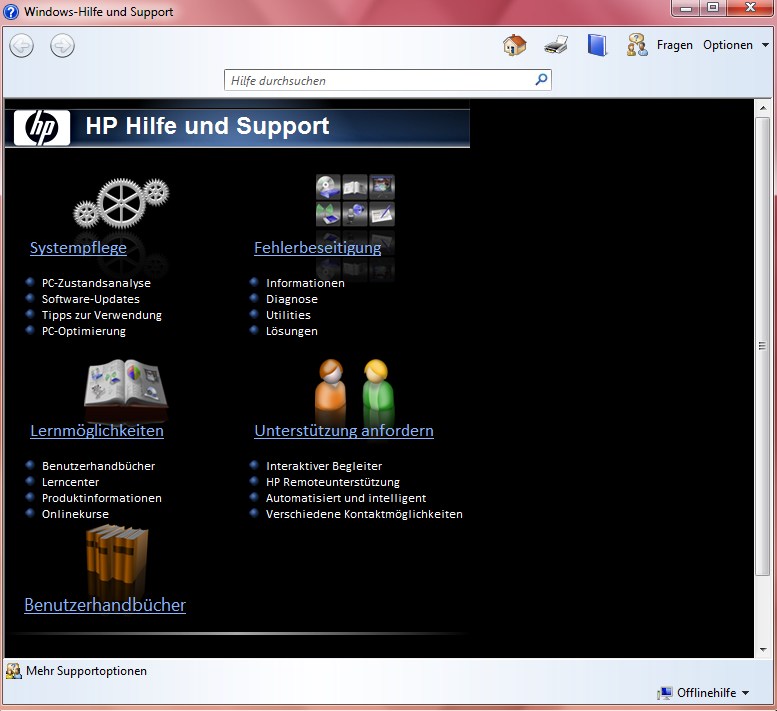 As usual for HP, so-called Care Packs with various scopes of service can be bought during the warranty period. They extend the warranty to two or three years and optionally offer additional protection, for example in cases of damages or spilled fluids. The available bundles in the manufacturer's online shop range between €58 and €165. 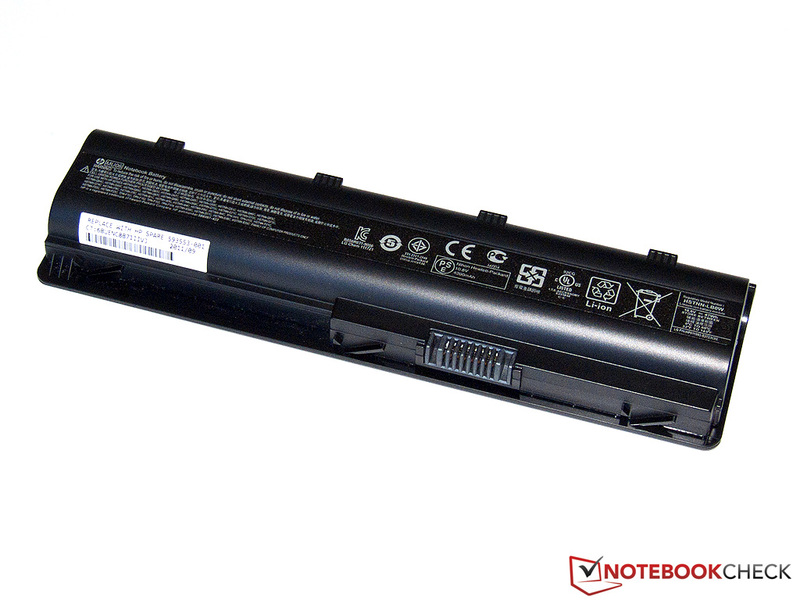 Until now, HP laptops were traditionally known for their very high quality input devices. 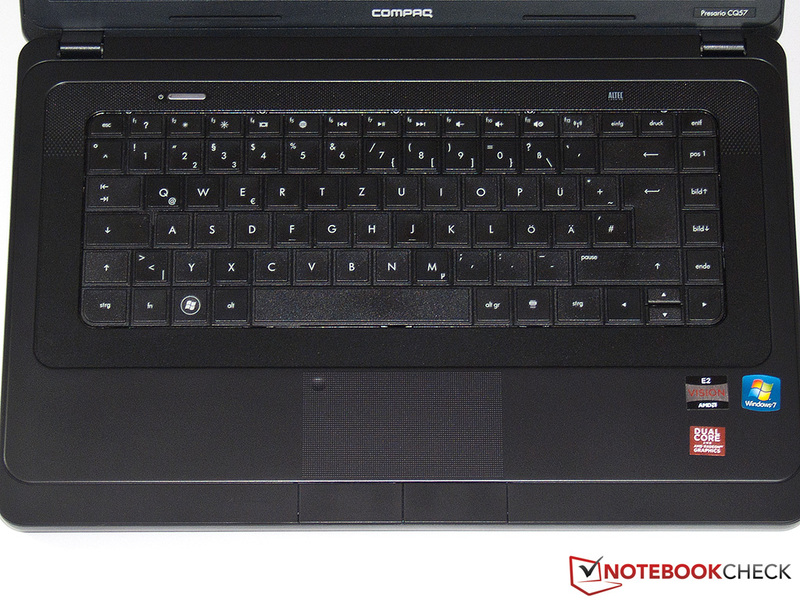 The manufacturer uses a conventional notebook keyboard without a dedicated number pad for the CQ57. Thus, a part of the available case width isn't used. The large keys, with an edge length of 15 millimeters, are placed densely beside one another. Nevertheless they are clearly separated by a small step on the base. Unusual: Two of the arrow keys are only half-size. This doesn't only prove to be an adverse feature in race games. We were a bit disappointed about the unsatisfactory mechanical stability. 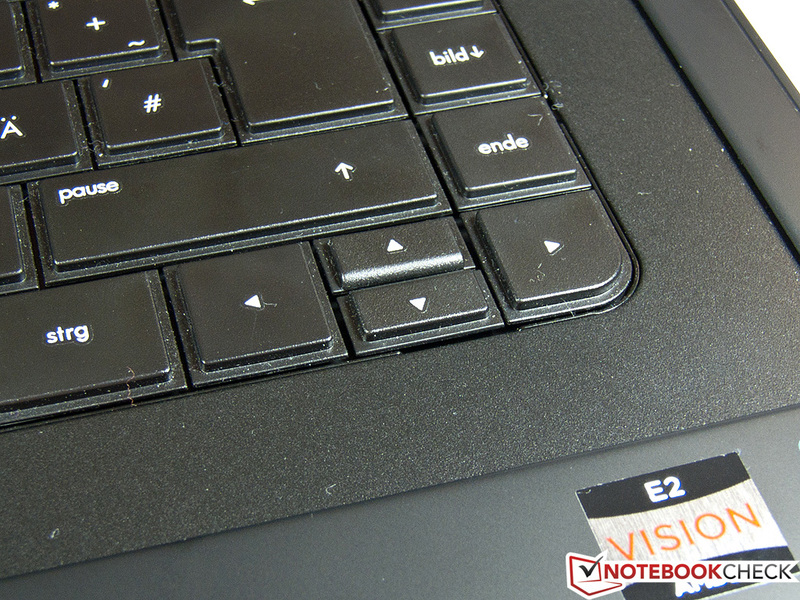 The keyboard partly yields noticeably even under slight pressure especially in the upper area. This makes a somewhat instable impression. Nevertheless, the typing feel convinces in contrast to many other low-priced devices: The slightly roughened keys need firm pressure which is implemented evenly and without jamming, even at the outer edges of the space bar. Despite the very short key drop, we achieve high typing speeds with a low error rate. The noise emission could have been a bit quieter, though it is on an average level. The touchpad's textured surface can be distinguished clearly from the wrist rest even without an additional bezel. The Synaptics input device delights us with excellent gliding traits and good precision. The surface area of 53x93 millimeters could have been a bit larger, but should be sufficient in most cases. Gestures are implemented reliably and smoothly up to the edges. As in all modern touchpads, multi-touch gestures are supported. They can be configured according to the user's preferences via software. The corresponding mouse keys aren't as convincing. They need quite a bit of force to overcome the stiff pressure point and trigger a fairly loud click. The keys should be pressed in the center because the accuracy diminishes toward the outer edges and quickly make a rather wobbly impression. Double clicking the touchpad in the left upper corner disables the input, for example when a mouse is to be connected via USB. As usual for the 15.6 inch category, a screen in a 16:9 format takes care of the Presario CQ57's image output. The pixel density is 100 dpi with a resolution of 1366x768 pixels. The manufacturer has regrettably used a glare surface in contrast to the HP 630/635. The installed LED backlight isn't particularly strong with an average maximum brightness of 176 cd/m2. The brightness should usually be enough for indoor use, especially since it isn't reduced on battery power. The Lenovo G575 gives a better performance as it has significantly more reserves for bright surroundings with about 225 cd/m2. The screen's illumination of good 85 percent is on a satisfactory level. The Samsung TN screen is, like all other immediate competitors, no shocker. Together with the high black value of 1.1 cd/m2, the screen achieves a contrast ratio of only 175:1. Despite all this criticism, we have to note that notebooks with a price beyond €1000 partly don't supply better rates either. 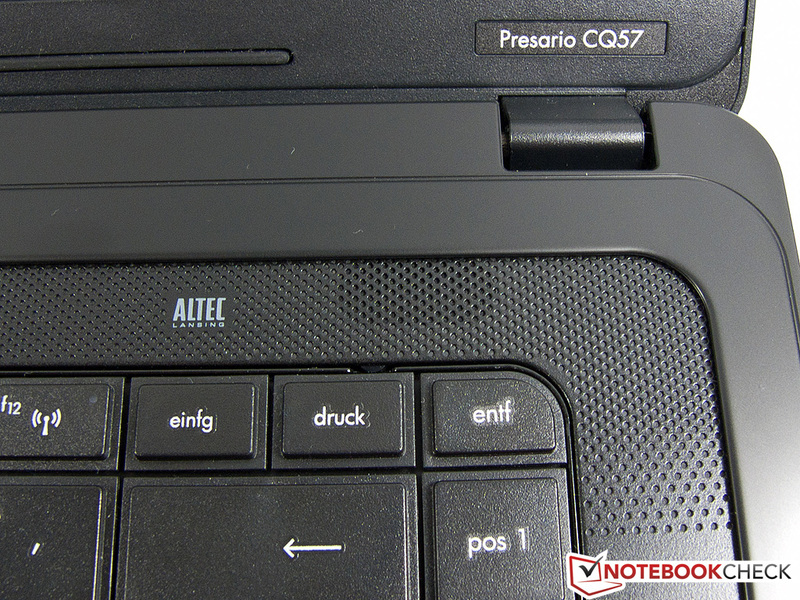 The low color spectrum of the Presario CQ57 should only be mentioned here. 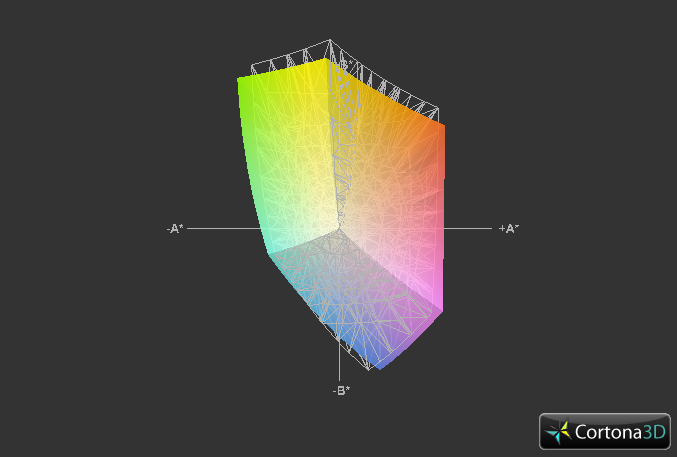 Although the screen can't reproduce the largest part of AdobeRGB or sRGB, it's not a limiting factor for home users. Professional picture or graphic editors won't get around a high-end IPS or VA screen. Our test sample practically calls for outdoor use due to its energy-efficient Fusion APU. Consequently we also tested the screen's capabilities in direct sunlight. As we assumed, we weren't particularly successful due to the low brightness and the reflective surface. The content legibility was prevented by annoying reflections most of the time. Users should thus retreat into the shade or to the desk at home. The viewing angle stability check confirmed the trend of prior tests. As typical for TN screens, the dependency on the viewer's position is particularly high vertically. The slightest deviation leads to a change in the displayed content. However, the colors already inverted visibly at about 30 degrees horizontally in our case. Thus, the Presario CQ57 doesn't qualify for a sociable movie night. 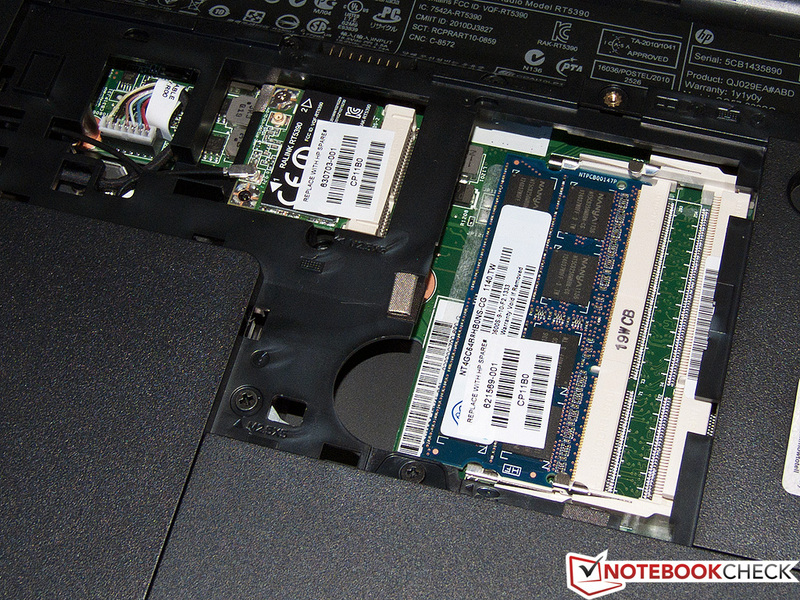 The heart of the Presario CQ57 is an E-450 Fusion APU from AMD. The energy-efficient chips from the E series are primarily conceived for small subnotebooks or nettops. However, some manufacturers also build them into affordable office models of bigger device categories. 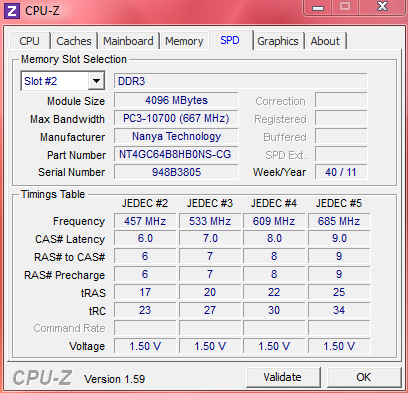 The E-450, clocked with 1.65 GHz, replaces its somewhat weaker precursor, E-350, and has a TDP of only 18 watts. The underlying Bobcat architecture has been optimized particularly for the lowest possible power consumption as well as a small chip area. Consequently, only a very limited performance is available despite two computing cores. 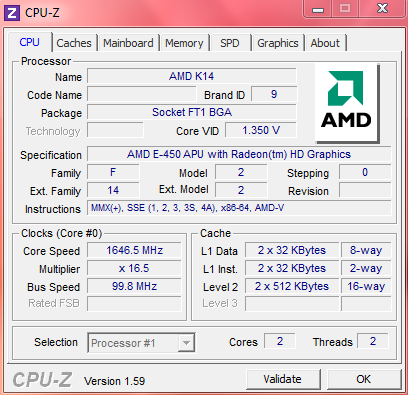 The feature set is limited to AMDs visualization technology, AMD-V, and the instruction set, SSE (1, 2, 3, 3S, 4A) and is thus a bit outdated. In contrast to Intel's Sandy Bridge architecture, the latest AVX instructions can't be executed. As in all models of the Fusion range, the E-450 has an integrated DirectX 11 capable graphics unit, known as Radeon HD 6320. It has a remarkable performance for ULV relations in consideration of 80 shaders (VLIW5) at a clock of 508 MHz. It can even be increased up to 600 MHz in Turbo mode. The biggest limiting factor is only the 64 bit wide memory interface. A second memory channel isn't supported. The built-in 4 gigabyte module comes from Nanya and runs on the maximum possible clock rate of 666 MHz / DDR3 1333. The memory can be upgraded from 4 to 8 gigabytes via a second slot when required. The buyer gets a surprisingly big, 500 GB hard disk for data storage. The E-450's processor performance is very modest. We only achieved 1173 points in Cinebench R10's single thread test in the 64 bit version. That is also far below the average for cheap office devices. The Pentium P6200 in the HP 630 achieved a 2.5 time better result with 2987 points. This power ratio is confirmed in the multi thread test, where the Presario CQ57 finishes with 2198 points. 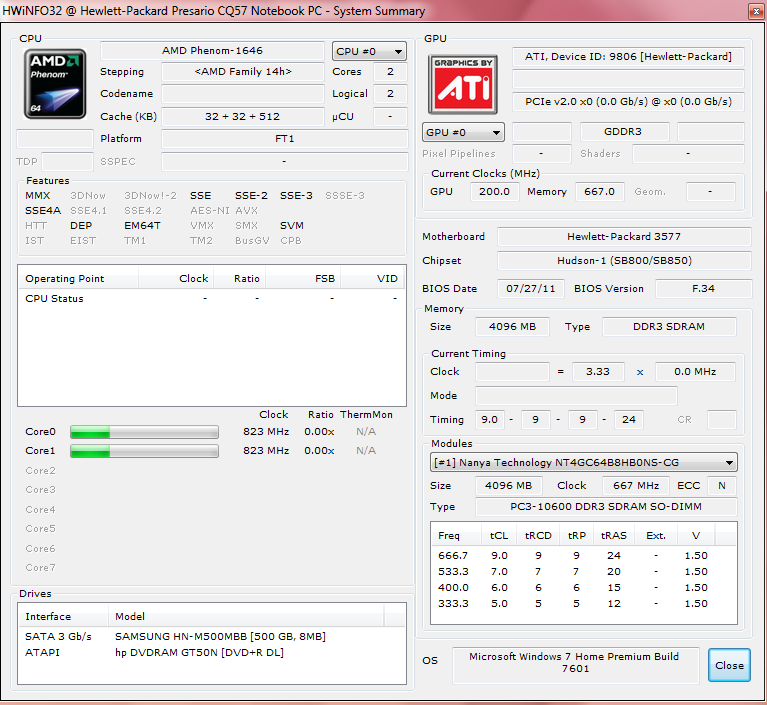 The E-450 places even itself just above the Intel Atom processor, N570, in Cinebench R11.5 with 0.62 points. 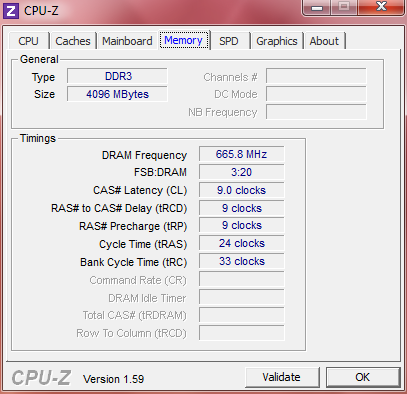 The increased clock of 50 MHz is hardly noticeable in our benchmarks compared to the E-350. The determined performance deficit, in comparison to the Pentium processors of the Arrandale or Sandy Bridge generation, can partly be ascribed to the low TDP of only 18 watts. 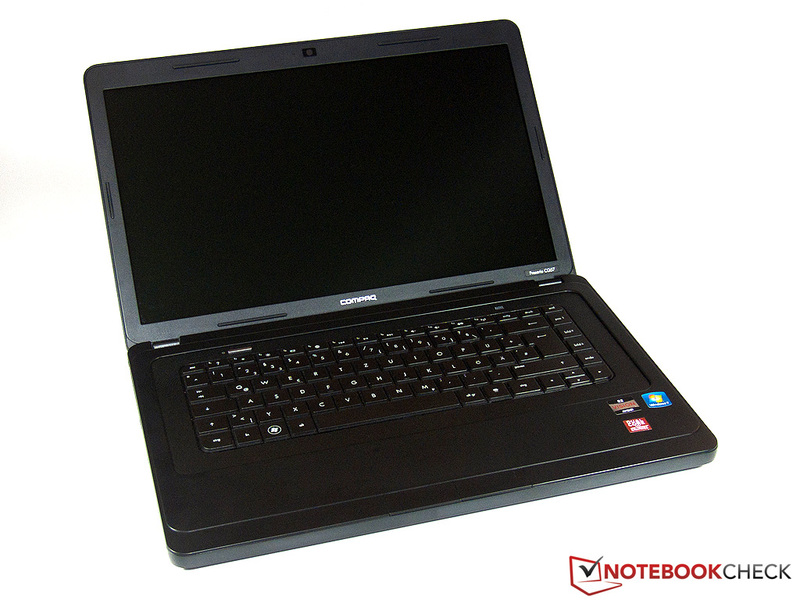 Consequently, the E-450 can also be installed in small subnotebooks with a screen size of 11 inches or more. This isn't possible with bigger CPUs with a TDP of 35 watts. The built-in Samsung Spinpoint M8 is a conventional 2.5 inch hard disk with a memory capacity of 500 gigabytes, 5400 rpm and an 8 MB cache. Only one disk is installed due to its particularly high data density. That should ensure good transmission rates. 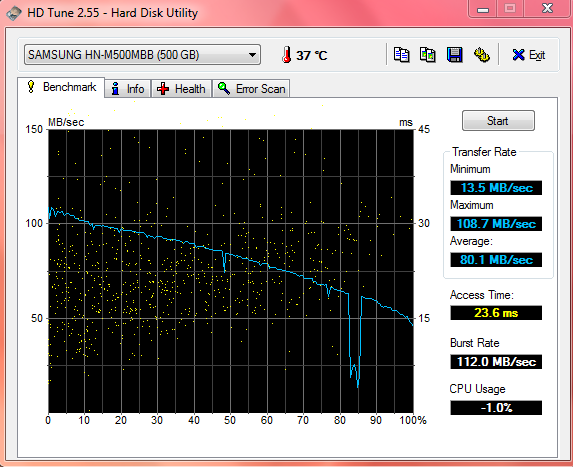 And in fact: We measure excellent read rates of up to 108.7 MB/s in the hard disk benchmark, HDTune. The average rate of just over 80 MB/s is also impressive. In view of such results, the Lenovo contender and both the HP 630 and 635 are clearly defeated. In return, the access time of 23.6 milliseconds is a bit weaker than expected. HP has reserved about 15 gigabytes for the recovery partition and another 4 gigabytes for a drive with so-called "HP Tools" from the total capacity. A special service menu can be opened with the latter by pressing a button. This service menu includes various diagnose functions and other tools. We use PCMark from the developer Futuremark to determine the synthetic application performance. 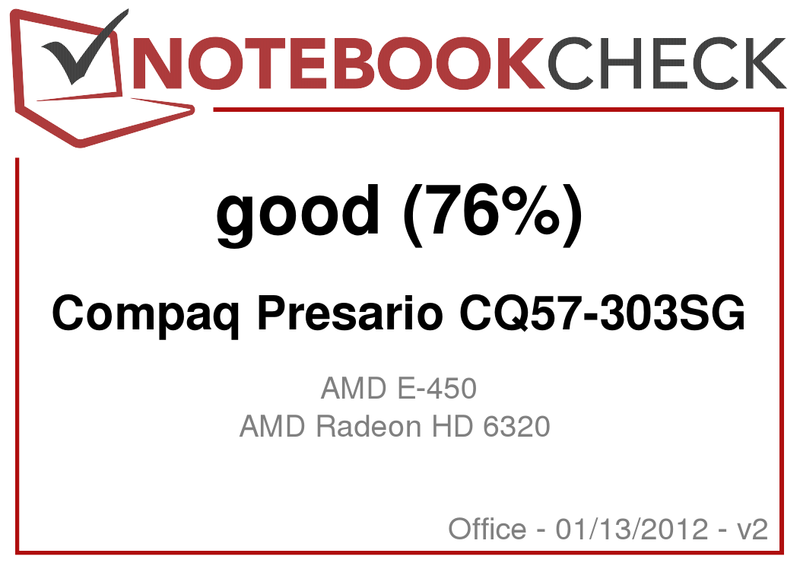 The Presario CQ57 can surpass the Lenovo G575 by about 5% with 2471 points in the Vantage version, which is mainly due to the somewhat faster APU in the HP notebook. Thus, the E-450 is a lot faster than netbooks based on Intel's Atom (Eee PC R051PX: 1742 points), but also lags just as evidently behind other office devices with a cheap Sandy Bridge CPU (HP 630: 3598 points). It looks similar in PCMark 7 where a score of 891 points was achieved. The processor's limited capacity is the notebook's biggest shortcoming. No matter if surfing, executing installations or starting programs: Compared to devices with faster CPUs, such as the Pentium P6200, delays are not only measurable but also noticeable. In order to play high definition trailers in 1080p smoothly, a corresponding codec and player are needed so that the integrated UVD3 video processor can take over the decoding. Office programs are the only applications that can be used without restrictions. 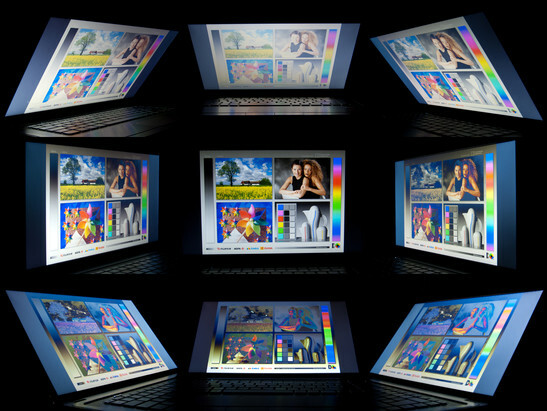 Complicated picture or video editing overburden the E-450's reserves and should preferably be performed on stronger hardware. Delays also have to be reckoned with during multitasking. In contrast to the processor unit, the graphics performance is fairly abundant as in all Fusion APUs. The results in 3DMark 06 with 2452 points and 3DMark Vantage (performance preset) with 898 points can easily beat the GMA HD in HP's 630. Even the precursor, E-350, is surpassed by about 20% - one advantage of the new Turbo mode that can increase the GPU's clock rate from 508 to 600 MHz. Another highlight is the implementation of the latest DirectX 11 standard. 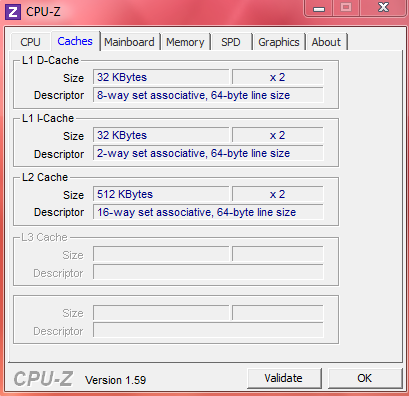 It will first be supported in Intel's IGPs in the upcoming Ivy Bridge generation. We will now check if the power is enough to render the newest games smoothly. 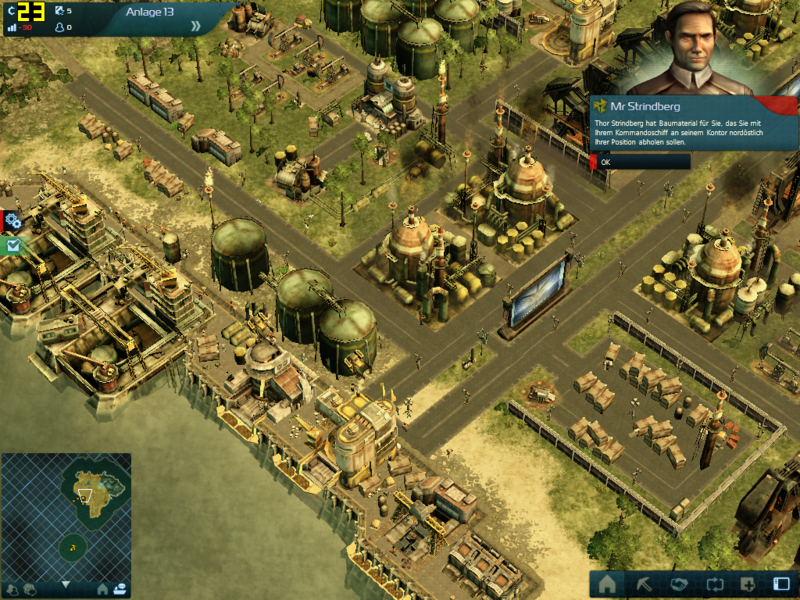 Our first benchmark is the building strategy game, Anno 2070, released at the end of 2011. We measure the performance in the intro sequence of the demo version's first mission. It gives a good indication about the average performance in the later course of the game. 1024x768 pixels and low details are the only setting that achieves almost playable frame rates of 27.8 fps. 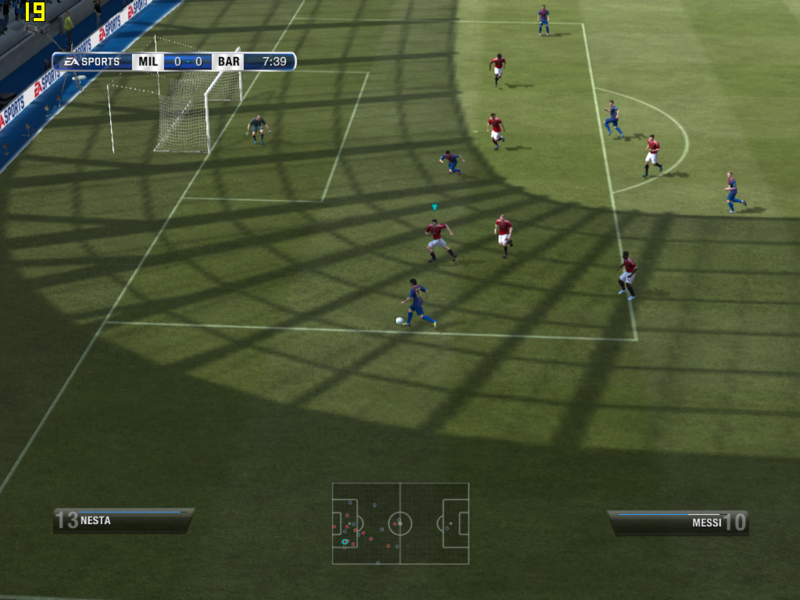 It looks the same with the soccer game, Fifa 12. 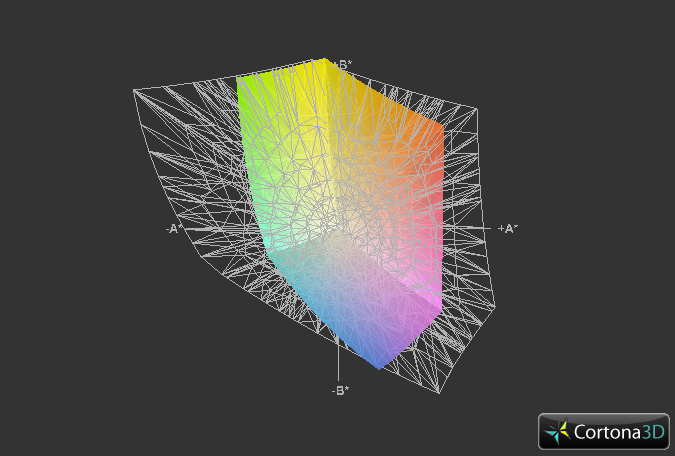 We have to use the lowest detail level and 800x600 pixels to render a slightly jerky 29 fps in a running game. The frame rates can even drop a lot more in replays under certain circumstances. 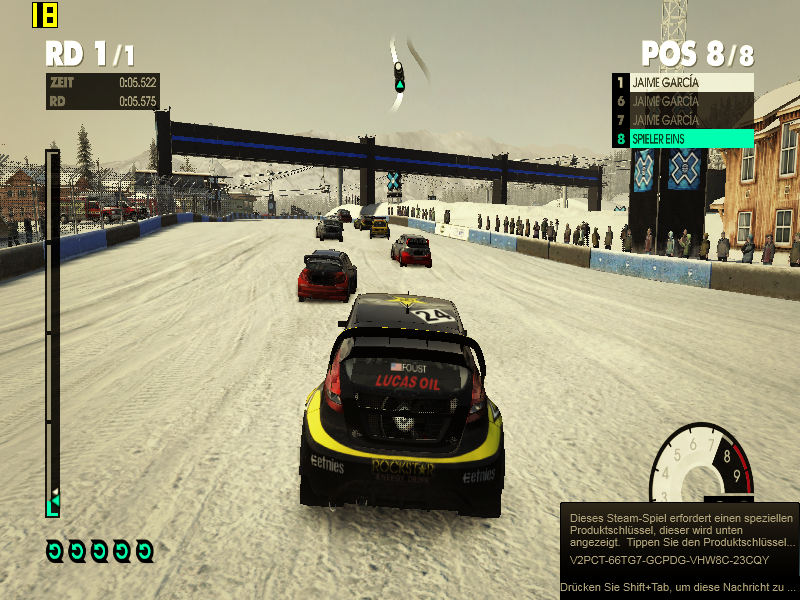 The last game we assess by using the built-in benchmark is the rally simulation, Dirt 3. As before, we also had to limit our demands on the image quality to a minimum so that we ultimately achieve 25.9 fps in 800x600 pixels and very low details. The E-450 is thus only suitable for current games to an extent. More often than not, the low processor performance is limiting so that even a reduction of the resolution partly doesn't enable unrestricted playability. 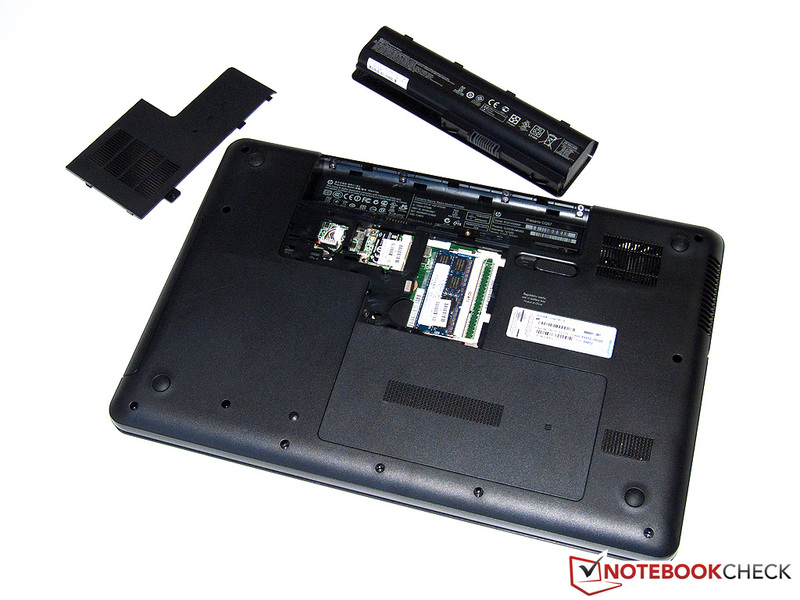 However, comparable notebooks like the HP 630 with Intel's P6200 do even worse. First the graphics unit from Sandy Bridge can outdo the small Fusion APU. 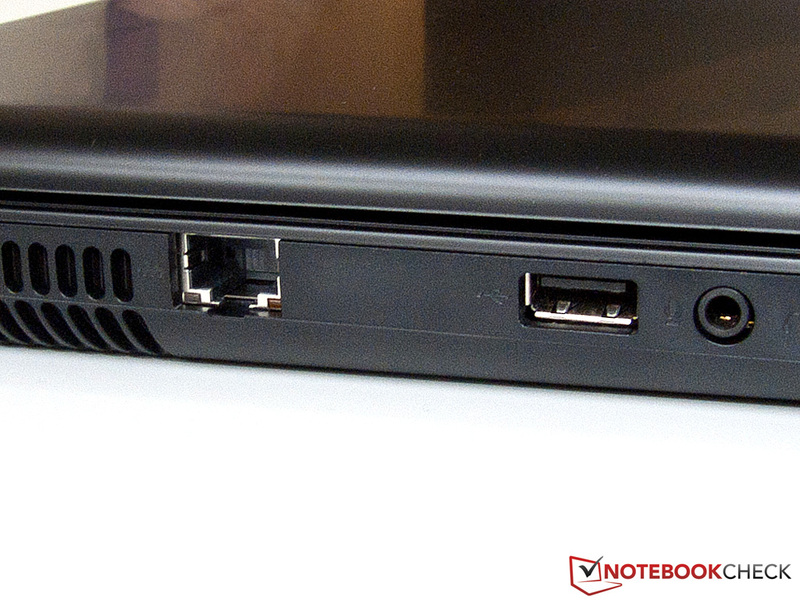 Netbook hardware in a spacious 15 inch case - a next to silent cooling shouldn't actually be a problem here. Unfortunately, HP has failed this goal more or less clearly. 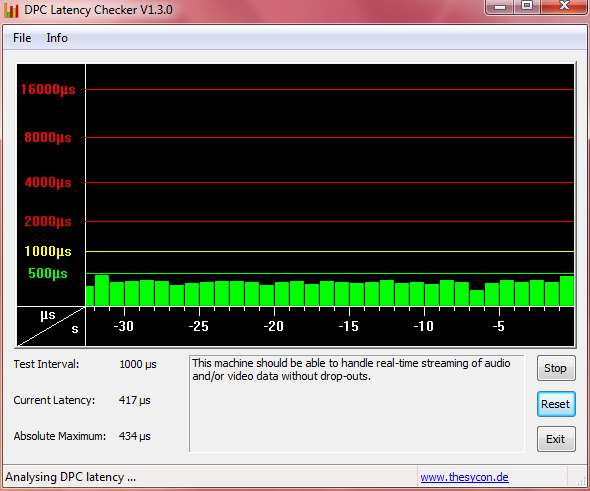 The fan in the Presario CQ57 runs constantly even during longer idle periods. The 32.3 dB (A) aren't at all annoyingly loud, but could have been a lot lower with a more cleverly devised fan. The hard disk also contributes to the noise level with its very audible access noise and pushes the noise up to 34.1 dB (A). A change in fan speed couldn't be determined during practical load, for example in 3DMark 06. The previous quiet whirr turns into a very audible airflow that reaches up to 38.5 dB (A) when we start both Prime95 and Furmark in our stress test. Thus, especially the fan that is permanently active even in idle remains to be criticized. The reason for this is found under the option "Fan Always On" in the BIOS. As soon as this is disabled, the Presario CQ57 runs almost silently depending on the load. However, this deviating setting in the manufacturer's default state of delivery is disregarded in our rating. Thanks to its energy-efficient Fusion APU, the temperature development remains on a very low level. We measure between 19 and 24 degrees Celsius on both the top and bottom in idle. That only increases to 26 degrees Celsius selectively in load. The user won't burn his fingers even directly at the vent with a lukewarm 37 degrees Celsius. 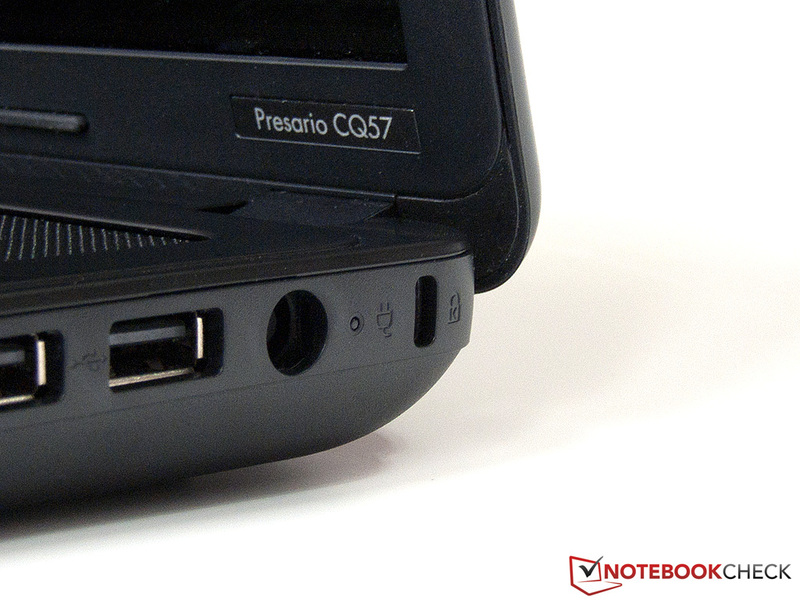 Thus, the Presario CQ57 can be used on the lap without hesitation. The notebook's hardware also stays cool. The cores' temperatures of the E-450 climb from 43 up to 59 degrees Celsius during full load. Thus, sufficient reserves are available even for midsummer temperatures. The power adapter's temperature of between 29 and 39 degrees Celsius is just as remarkable. Among the competitors, only the Lenovo G575 clearly falls behind because its E-350 processor showed first signs of throttling at a temperature of up to 99 degrees Celsius in the stress test. (+) The average temperature for the upper side under maximal load is 26 °C / 79 F, compared to the average of 29.4 °C / 85 F for the devices in the class Office. HP promotes the installed Altec Lansing stereo speakers with a small sticker. However, they don't stand out much from the competition. We suspect that the sound system used in the HP 630 / HP 635 models has been adopted without modifications. While the good maximum volume and clear sound in the high-frequency range can be praised, the bass range has little power. Speech convinces with good understandability, but sounds a bit tinny. Basically, the quality is acceptable for a low cost notebook, even if we would recommend connecting external speakers. That is only possible analog via the headphone out due to the lack of an HDMI port. 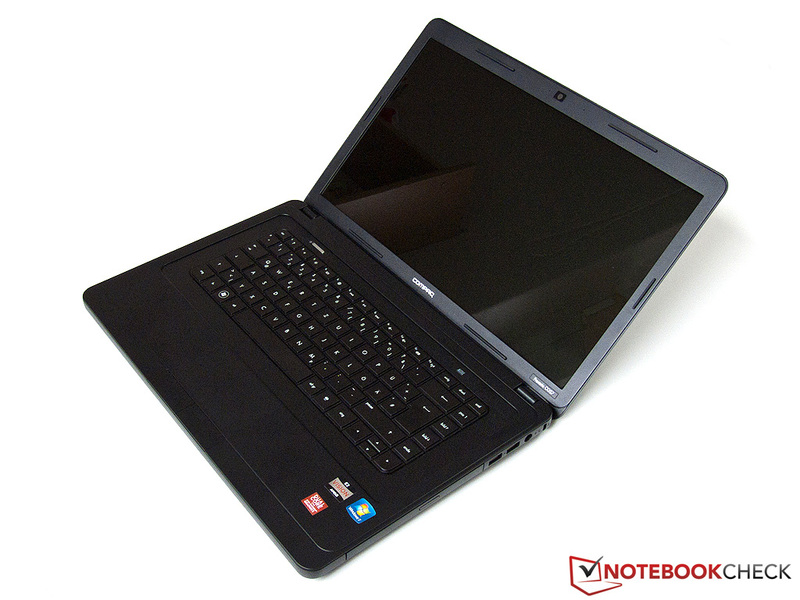 We've seen the low power consumption of AMD's E series in previously tested notebooks, such as the Lenovo G575. The Presario CQ57 isn't any different here and is content with low 7.3 to 10.4 watts in idle. The higher rate is especially significant for practical use. It is determined with an enabled WLAN connection and maximum screen brightness. HP's 630 with a Pentium P6200 processor consumed a bit more, whereby Intel's latest Sandy Bridge generation is on a par in this field. 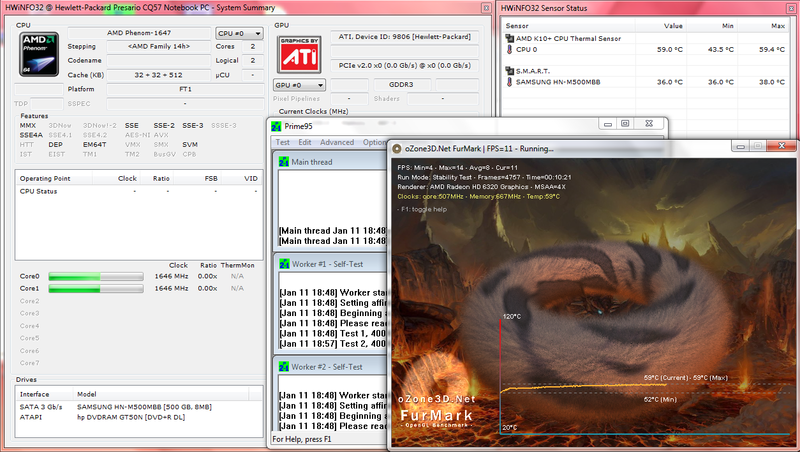 The power consumption increases to 22.8 watts in 3DMark 06 and its peak is 28 watts in our stress test. Both rates are excellent and on a par with other ULV processors that have a similar TDP. 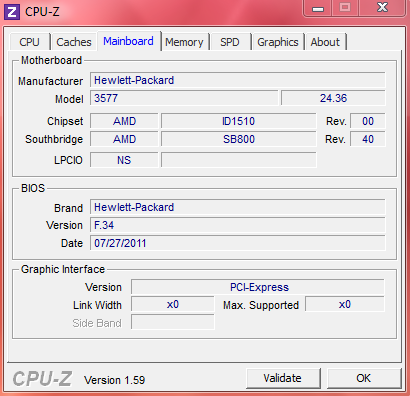 Only the HP 635 is a bit better with a maximum of 20 watts, but it is equipped with the E-240 single core CPU. 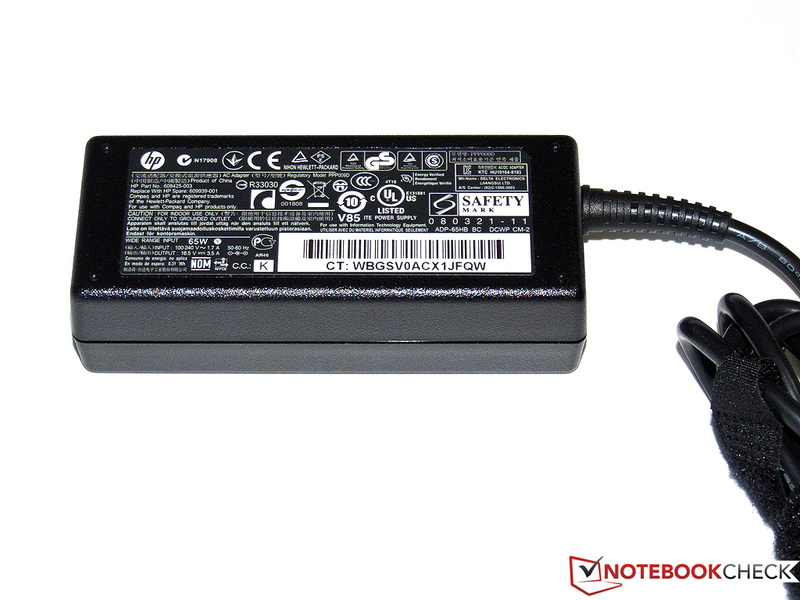 The manufacturer delivers the notebook with a compact 65 watt power adapter, which almost seems too big in view of the low power consumption. Therefore, it's no problem to recharge the battery even during full load use. Our test sample owes its remarkable runtimes to the lower power consumption. Even if the 47 Wh battery isn't particularly big, the Presario CQ57 manages far more than 7 hours away from an outlet in idle. Reading a text document is simulated in the BatteryEater Reader's test. Here, WLAN is disabled and the maximum energy saving options are selected. In practical use, the runtime is just as generous with 5 hours of surfing (screen brightness: 150 cd/m2). Movies can be played via the built-in DVD drive for almost 4 hours. The battery is drained after about 2 hours when we enable "High Performance" in Windows' energy savings options and start BatteryEater's Classic test. Like in the other measurements, HP gives up a somewhat longer battery life because the notebook automatically shuts down at a charge level of 9 percent at the latest. In return, the battery's life expectation is increased because frequent deep discharging can damage the lithium ion battery permanently. We can conclude the verdict for HP's Compaq Presario CQ57 with the title of a bestseller from Johannes Mario Simmel - "It Doesn't Always Have to be Caviar". 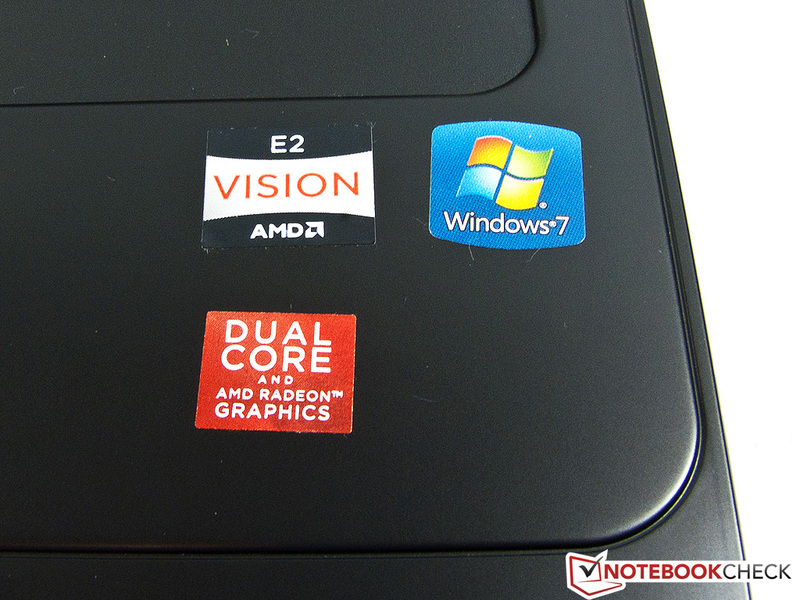 The affordable entry level device can score in many aspects that are frivolously wasted by other, frequently much more expensive notebooks, though it has a few weaknesses. We'll start with the good workmanship: The case, known from other HP models, convinces with high stability, which only could be improved a bit in terms of the display. The keyboard's good typing experience and the touchpad's accuracy also deserve praise. The Fusion APU E-450 from AMD is a curse and a blessing at the same time. The low power consumption of only 18 watts TDP is reflected in long battery runtimes and minimum heat development. Moreover, a few games can be rendered smoothly thanks to a comparatively strong graphics unit. The CPU's performance deficit is all the more vast and even noticeable in routine use compared to Intel's Pentium processors. 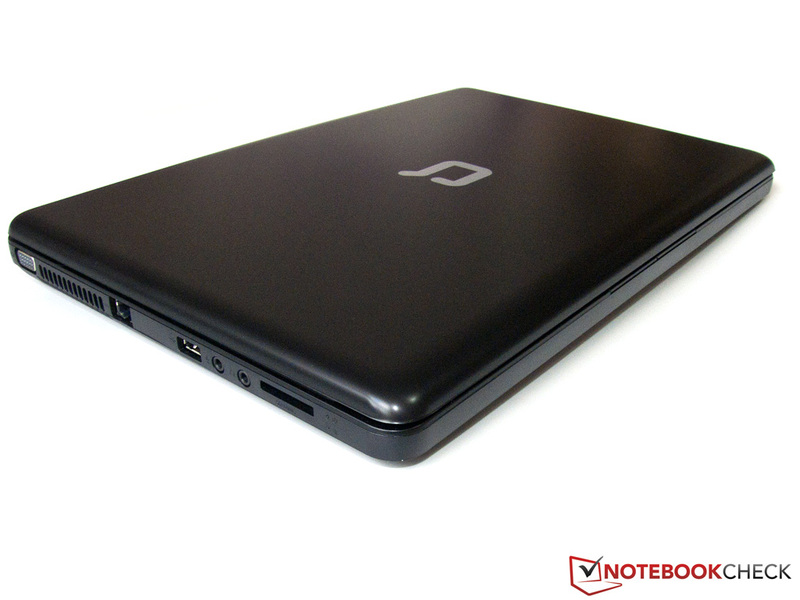 Thus, the Presario CQ57 would be ideal as an affordable office device with multimedia qualities that can occasionally be used remote from an outlet. Our overall rating of 76 percent may seem low, but considering the price of less than €330 the buyer gets impressive value for his money. 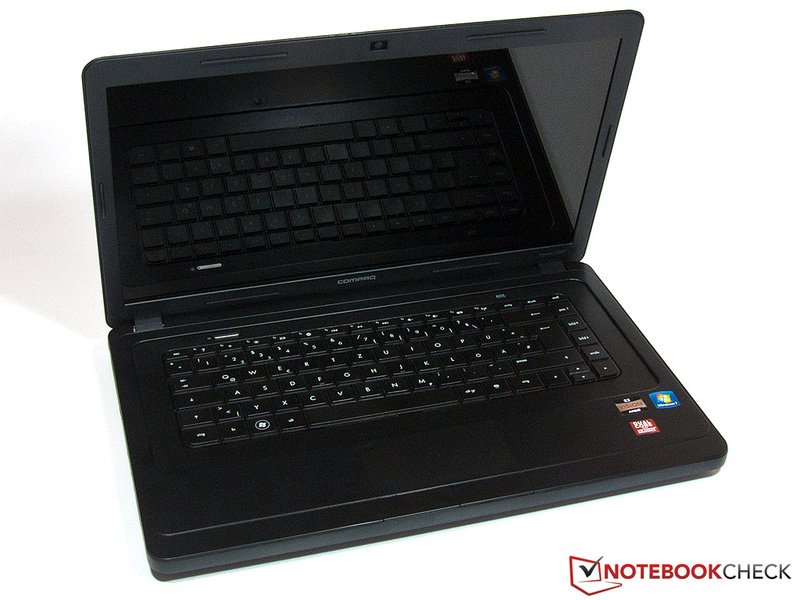 Faster and better equipped notebooks, such as the HP 630, meanwhile also available with Sandy Bridge processors, cost a lot more with starting about €400. A 500 GB HDD and 4 GB of RAM are installed. and hard disk step by step. just like the webcam's picture quality. and the keyboard impresses with fast typing speeds. a DVD burner are included. comes with an energy-efficient Fusion APU from AMD. 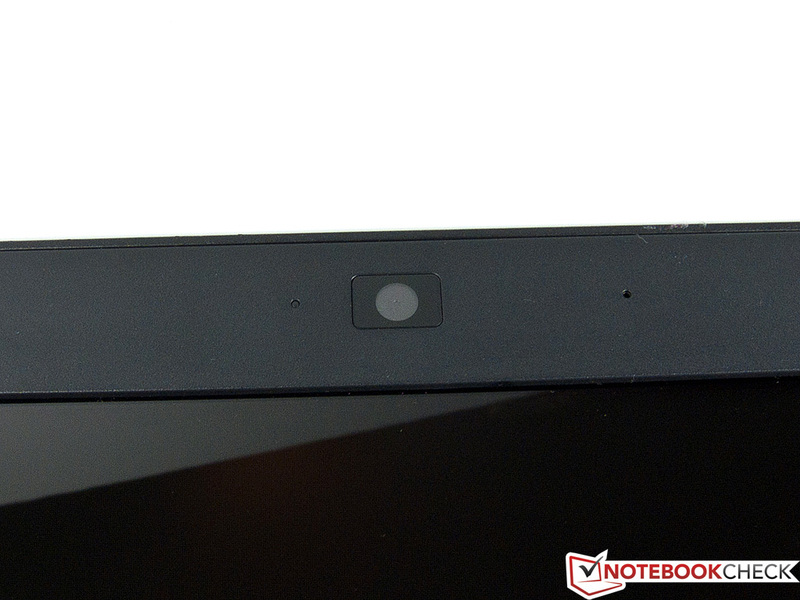 is how the HP Presario CQ57 presents itself to the eye of the beholder. 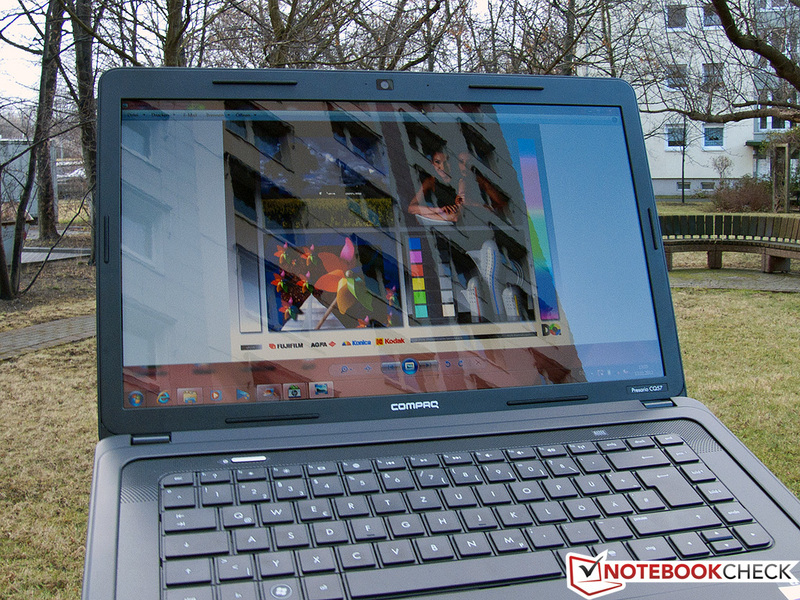 the notebook's consumption remains below 30 watts even in full load. ...but unfortunately not in the application performance. 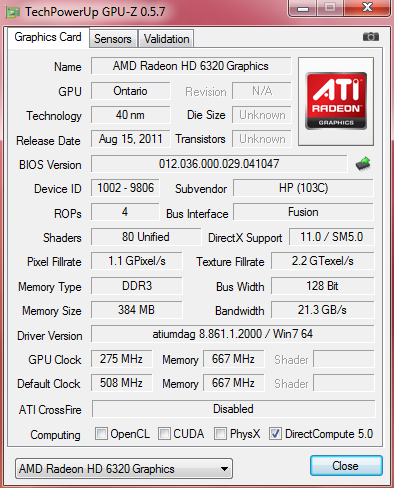 The Fusion APU E-450 has a good graphics unit, but the processor is beaten by even older Core Duo CPUs. We would also have appreciated a bigger scope of interfaces. It is fascinating how much you can get for a price just under €330. 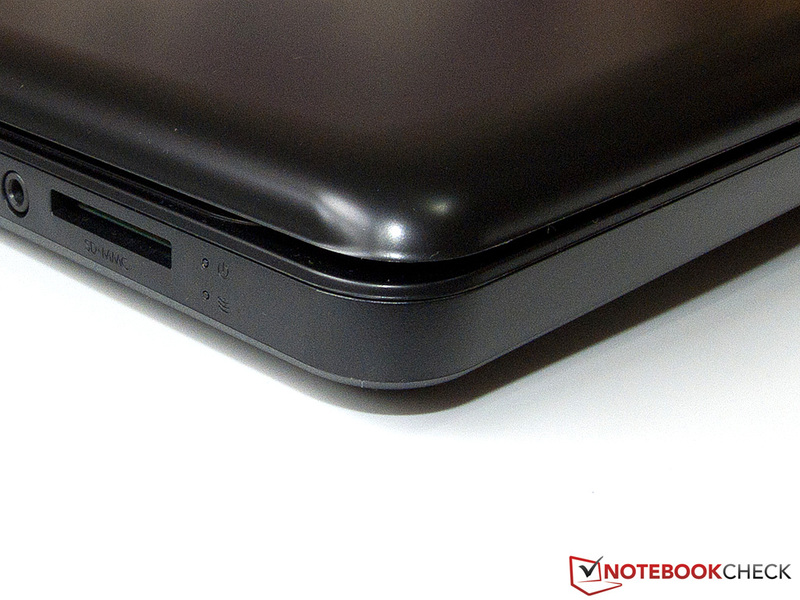 The notebook has enough reserves for everyday tasks, which equally expensive netbooks with an Intel Atom can't offer. 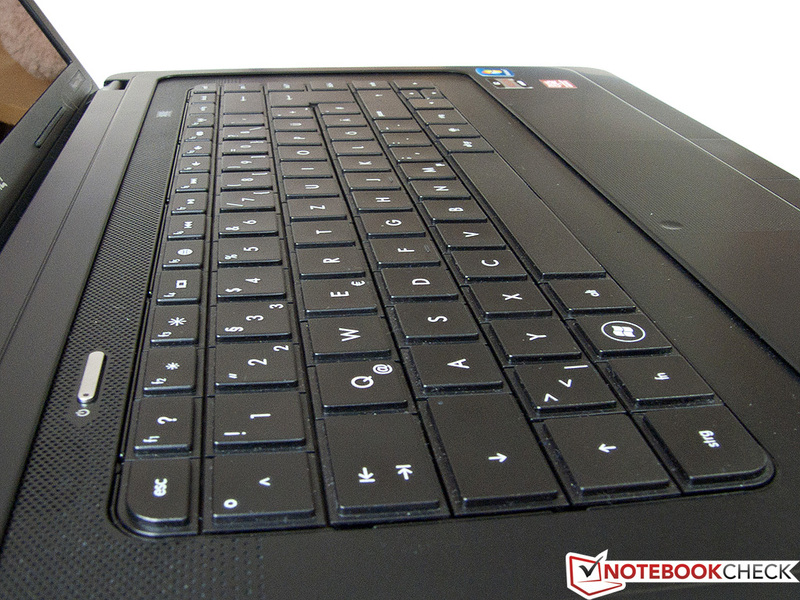 Among the competitors that we have previously reviewed: HP 630, HP 635 or the Lenovo G575. 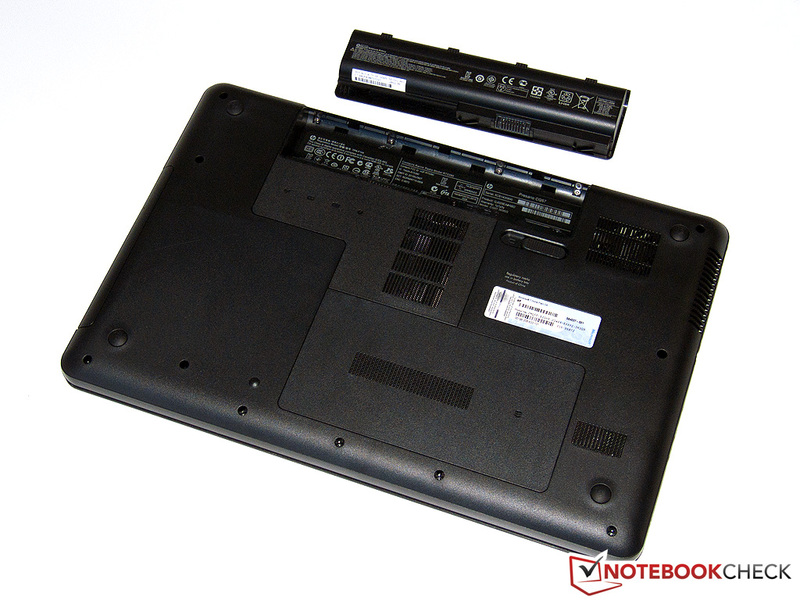 Depending on the configuration, the Fujitsu Lifebook AH530 is available for less than €400.